Only a week until the summer holidays and we know you’ve been asking about what is on – and the answer is LOADS! You can see all of the summer holiday activities and events by going to our SUMMER HOLIDAY PAGE HERE. 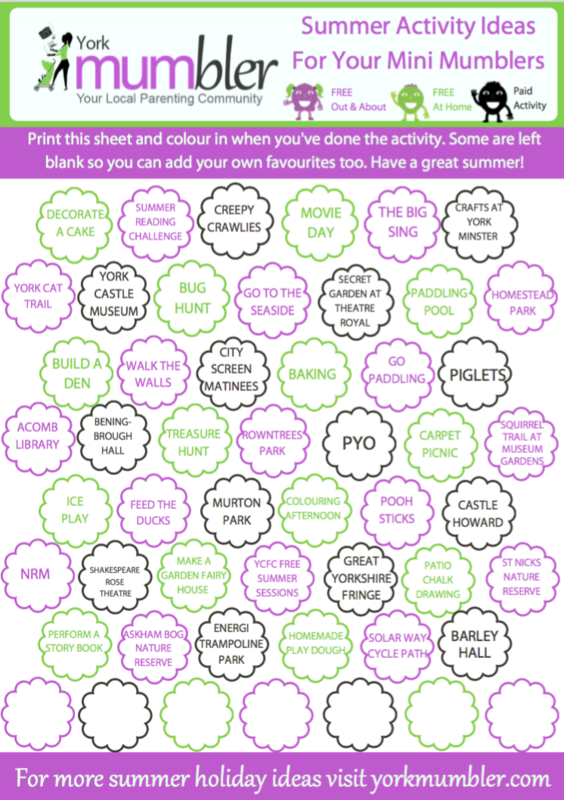 If you want a simple plan for the summer, with a good mix of Free, Paid for and At home options then just download our summer holiday activity sheet by clicking on this link Summer Activities Ideas in York-2018. You can see it below – we have one all filled out for you (with a few spaces for you to add in your favourite things) and also a blank version so you can plan your own fun summer. Whatever you do, I hope you and the mini mumblers have fun and make the most of our wonderful city at this time of year!